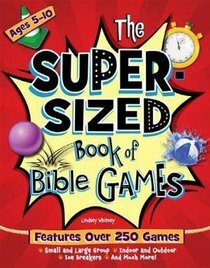 This Super-Sized Book of Bible Games is a giant, HUMONGOUS book packed with over 250 exciting games for every occasion. From icebreakers to outdoor games, this book doesn't just offer one type of game-it offers fourteen different types and offers more games than almost any other book on the market! Each game comes with an overview, step-by-step instructions, supply list, scripture connection, discussion questions, and a teachable moment that connects God's word to the activity. Quickly and conveniently find what you are looking for with its quick reference index that is arranged by topic, type, andScripture.The variety of games in this book make it well suited for use in any setting: weekend ministry, midweek, VBS, mission trips, or anytime a group of children is together. All the games you need in one place will make this book your top go-to resource! This book includes game types like Old Testament, New Testament, Ice Breakers, Indoor, Outdoor, Wet and Wild Water, Small Group, Large Group, Quiet, Quick No-Prep, and much, much more! About "The Super-Sized Book of Bible Games"